You may have noticed that the theme of the upcoming 37th Annual E. F. Schumacher Lectures on November 4th is “Choosing the Path that is Green“. This is a reference to a prophecy of the Anishinaabeg peoples, of whom Winona LaDuke—this year’s keynote speaker— is a member. 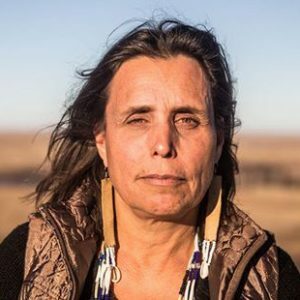 Winona LaDuke is an activist, community economist, and author. Her ongoing work has always been in close alignment with the work of the Schumacher Center. Like us, she is an advocate for community land stewardship, local food sovereignty, and sustainable resource use. Yet a unique aspect that makes LaDuke such a compelling speaker is her ability to communicate stories and ideas of the Anishinaabeg peoples in ways that are both timely and relevant. When it comes to the concepts of land ownership and usage, language is even more crucial. “In our language the words Anishinaabeg akiing describe the concept of land ownership. They translate as “the land of the people, “which doesn’t imply that we own our land but that we belong on it,” LaDuke explained. If different languages influence our minds in different ways, this is not because of what our language allows us to think but rather because of what it habitually obliges us to think about. When the nouns in one’s language are animate, living entities— could that influence a community’s ability to manage its land and natural resources? Could such a worldview offer some wisdom or insight into how to guide communities in the correct direction? It appears that way. Speaking on food sovereignty, LaDuke said that for many indigenous peoples around the world, food crops are understood to be their relatives. The indigenous people on the Big Island of Hawaii “consider that the taro was their older brother,” LaDuke said in a Tedx Talk, “and so it is not surprising that they, like the Ojibwe people, fought the genetic engineering of our wild rice.” And they won. She described the successes of indigenous peoples who took action in their communities against the genetic modification of food crops and seed patenting, and how they were spurred to action because of their more holistic worldview. Yet it’s not just organic farming that can benefit from such a worldview. When LaDuke spoke about the Anishinaabeg practices relating to land use and ownership, she mentioned that they were very similar to the community land trust model, as advanced by the Schumacher Center. The land is owned collectively, and we have individual or, more often, family-based usufruct rights: each family has traditional areas where it fishes and hunts. We have “hunting bosses” and “rice chiefs,” who make sure that resources are used sustainably in each region. Hunting bosses oversee trap-line rotation, a system by which people trap in an area for two years and then move to a different area to let the land rest. Rice chiefs coordinate wild rice harvesting. The rice on each lake is unique: each has its own taste and ripens at its own time. We also have a “tallyman,” who makes sure there are enough animals for each family in a given area. If a family can’t sustain itself, the tallyman moves them to a new place where animals are more plentiful. These practices are sustainable. If this sounds familiar, it may be because Elinor Ostrom won the 2009 Nobel Prize in Economics for analyzing and popularizing these ideas. 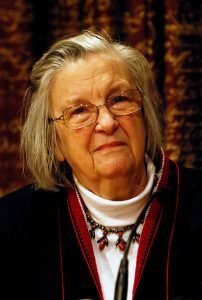 Ostrom was awarded the prize “for her analysis of economic governance, especially the commons” after she looked into the practices of natural resource management of groups like the Anishinaabeg, who had been managing their resources sustainably for centuries. In fact, indigenous institutions that have evolved in remote locations may become untenable at later junctures if those areas become attractive to external users who have the backing of a regional or national government… Without the advantage of being considered legitimate, a small group of local appropriators can face high costs in trying to exclude well-financed, government-supported users. Our definition doesn’t stand up well in court, unfortunately, because this country’s legal system upholds the concept of private property. So it seems that sustainability is not a matter of cold, logical calculation and business practices—it is an integral matter of culture, language and worldview itself. We must not only re-educate ourselves, but also challenge dominant paradigms and critique the institutions that take us down the scorched path rather than the path that is green. We invite you to join us in this conversation at our 37th Annual E. F. Schumacher Lectures. If you’re in the Great Barrington area on November 4th, we invite you to join us for Winona LaDuke’s keynote address and panel discussion following it —just make sure to book your tickets soon. If you are unable to attend, the keynote lecture and panel discussion will be available on our YouTube Channel and we will notify you when we have printed pamphlet versions of the conversations available for purchase.